Write your own 'I Can Quit Whenever I Want' review. Carlos Therón, the director of the film, he's used to comedy genre. Therón has directed 'Fuga de cerebros 2'(2001), 'Es por tu bien' (2017) and he has participated in series as 'El chiringuito de Pepe' (2012) or 'Mira lo que has hecho' (2019). 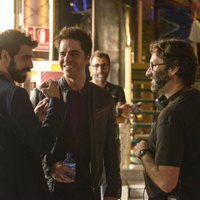 The film is been filming in different locations in Madrid. Carlos Santos had a Goya for Best Actor Revelation with 'El hombre de las mil caras' (2016) and David Verdaguer had another one for Best Supporting Actor with 'Verano 1993' (2017).